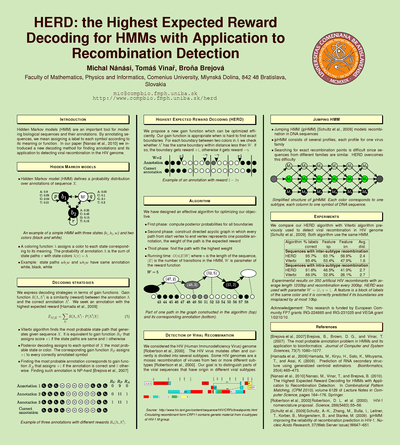 HERD is a new decoding method for HMMs, developed for applications, where is difficult to predict annotation boundaries. Unlike traditional decoding methods (like Viterbi algorithm), HERD scores breakpoints individually to maximize the number of correctly predicted annotation boundaries. Currently our implementation work only on the problem of viral recombination detection in HIV genome. In the section method are discussed algorithms used in HERD. You can download our algorithm along with the source code. You can also read the manual page.